It’s not-so-good news for the fans of actor Surya. After the release of 'Singam 2', the actor was expected to join hands with director Gautham Menon for 'Dhruva Natchathiram', which might have been their third film together if actor Surya didn’t decide to move out from the project on Thursday. The pooja for 'Dhruva Natchathiram' happened recently and the shoot was carried out for a week. 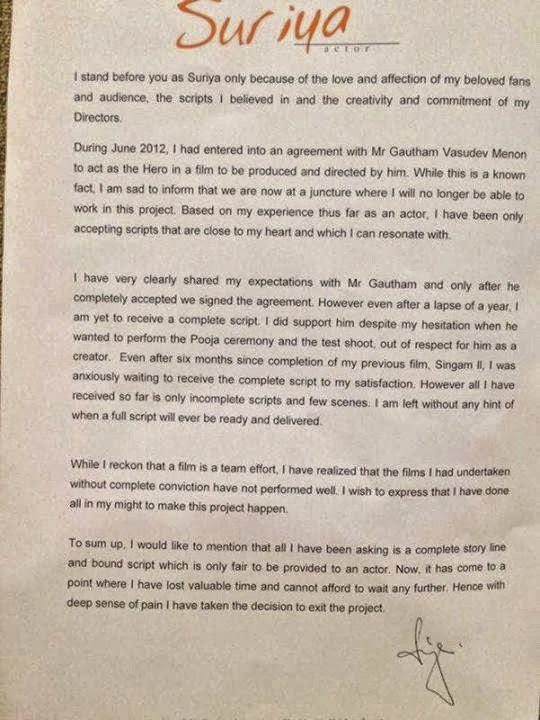 But the project didn’t progress, as Surya wasn’t too happy about the script. 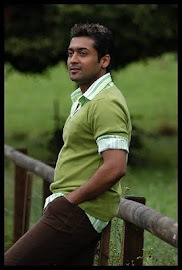 Recently Gautham Menon wrote in his microblogging website, “Reworked a script for Surya. Hopefully we’ll start very soon. Lots of writing, lots of scripts in hand now. Here’s to good times ahead.” But in contrary to his tweet, in an official statement to press, the Varanam Aayiram star has confirmed that he wouldn’t be a part of 'Dhruva Natchathiram'. 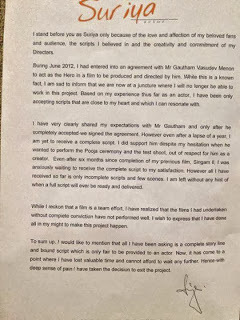 Surya added, “To sum up, I would like to mention that all I have been asking is a complete story line and bound script which is only fair to be provided to an actor. It has come to a point where I have lost valuable time and cannot afford to wait any further. Hence with deep sense of pain I have taken the decision to exit the project.” Director Gautham Menon was not available to comment. Sources in the industry say that Surya will now begin to work for director Lingusamy’s project full time.